Trade associations advance their industries through collaboration, instruction, product displays, and accreditation. They exist to cultivate industry knowledge and practices. For Canada’s landscaping industry, Landscape Ontario is the association of choice with over 2,000 registered professionals amongst its ranks. Their code of ethics exhibits a common ground of professionalism and reliability. Landscape Ontario hosts an annual Congress, which remains the biggest event of the year for Canada's landscaping industry. Since our Canada office opened just last year, we sent our Landmark Product Marketing Manager, Eric Gilbey, PLA, to Toronto to help acquaint the office to new industry exposures. Once back in Maryland, Gilbey had tons to say about the value of trade associations in general. And he attends trade shows like Congress as part of his job, so his input is particularly meaningful! “It’s a tremendous experience for landscape and horticultural professionals in that province,” Gilbey said. The Congress, to Gilbey, is much more than a simple meet-up: in an increasingly digital world of design, it marks the significance of in-person, organic collaboration. 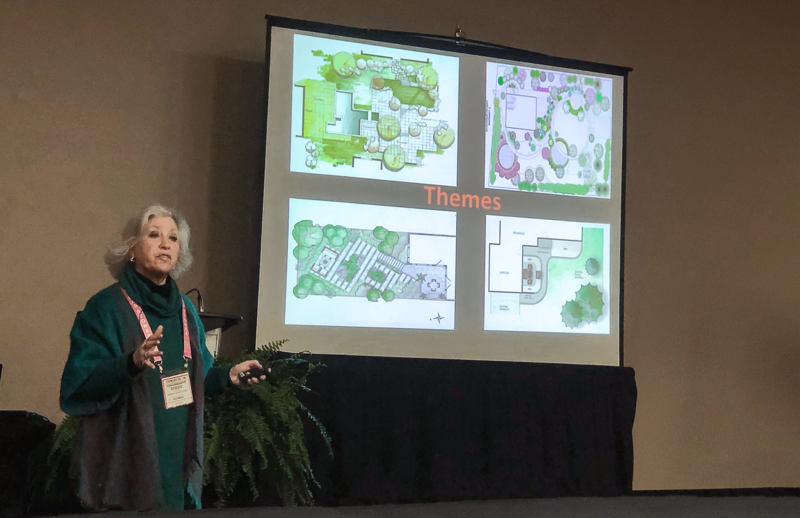 Bobbie Schwartz of Bobbie's Green Thumb presenting design plans at the Landscape Ontario Congress. Beyond the thousands of products and technologies displayed at the event, the Congress hosts seminars aimed at “advancing the horticultural industry,” according to their website, making it an all-together valuable experience for professionals looking to expand their industry influence. January’s congress was massive. It was a 3-day, 10-acre conference with over 600 vendors and 13,000 attendees. “It allows landscape professionals to understand broader industry context and ways to apply this knowledge to benefit themselves and their clients,” Gilbey said. To illustrate, he referred to a presentation where an audience member mentioned integrated pest control, a topic that’s perhaps easy to overlook in landscape design. “Hearing adjacent industry colleagues — entomologists and organic plant care specialists, for example — discussing better plant choices and maintenance practices can really enhance design acumen in these small but noticeable ways,” he added. The exposure and awareness offered by trade shows can boost any designer’s repertoire, validating them as creatives. And that’s not to mention the awards. Landscape Ontario hosts an awards show, brazenly referred to as “the Oscars of the green profession,” aimed at recognizing overall design excellence and appeal. They award plaques in landscape construction, maintenance, design, irrigation, interior plantscaping, gardening, and growing — a wide range of categories that Gilbey called “a pleasant surprise.” He said it seems like Landscape Ontario wants its members to feel recognized, to truly appreciate what membership entails. One of our users, Partridge Fine Landscapes Ltd., a firm in Toronto, won four Landscape Ontario Awards of Excellence for their project featuring an outdoor TV space. Congress incited Gilbey to note a rising trend of unique outdoor spaces, with features like outdoor TVs, lap pools, and sports courts, a useful consideration as we continue adapting Vectorworks Landmark to industry trends. 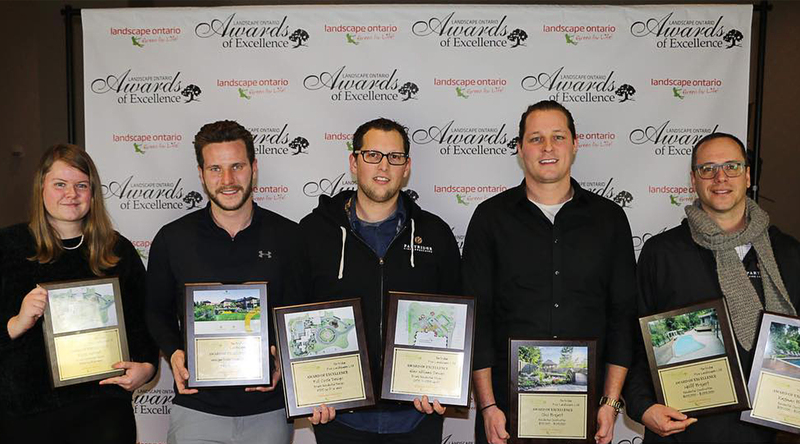 Members of Partridge Fine Landscapes, Ltd. receiving Landscape Ontario Awards of Excellence. Image courtesy of Partridge Fine Landscapes, Ltd.
There’s a trade association nearly everywhere, it’s just a matter of finding the right one for you. In the UK, there’s the Association of Professional Landscapers which, similar to Landscape Ontario, breeds a common ground of reliability — the goal is to provide consumers with a database of accredited landscapers to choose from. Back in the U.S., The National Association of Landscape Professionals (NALP) has nearly 100,000 members and trains and accredits landscapers. Colocated with the GIE+Expo event, which boasts around 18,000 attendees, the NALP hosts an annual conference they call LANDSCAPES, whose mission matches that of the Landscape Ontario Congress. The Association of Professional Landscape Designers offers professional connectivity and development to landscape desginers — in 1990 they introduced the APLD certification “to advance the profession of landscape design and to promote the recognition of landscape designers as qualified and dedicated professionals.” APLD hosts the APLD International Design Conference, happening this year July 25 – 29 in Seattle, Washington. Check out our events page to find a trade show near you.